And the cotton is high..” by DuBose Heyward. So I gathered bits and pieces from here and there that I felt I needed to tell the world. Starting with food. Here’s a real quick and tasty recipe of Pattypan summer squashes. I just got them at our local farmers market. They’re not only cute and add color to your dinner table, but also, ahammm, healthy (here). Most of all- they’re yummy ! All there’s to do: Cut them into halves wide-wise. Also cut a thin flat slice at each end, so the half squashes could rest steadily in the baking dish (wide side facing up). Turn oven to 400 F or 200 C. Drizzle olive oil, bit of salt, crushed or chopped garlic and coarsely chopped rosemary on the yellow shining faces of the squashes. That’s all folks. Cover with aluminum foil, put in oven for 30 minutes. Take off foil and let them pattypans get some oven tan till they’re golden(ish). Out of the oven and into your plate they go. With some nice green salad on the side. Ahh ha. Oh yeah- don’t over roast them, they don’t like to dry out. more food: Yesterday, on our way to one of the last shows of HAIR in Broadway, a small window on 9th Ave. caught our eyes. A pile of some fine-looking Bourekas just called us in. 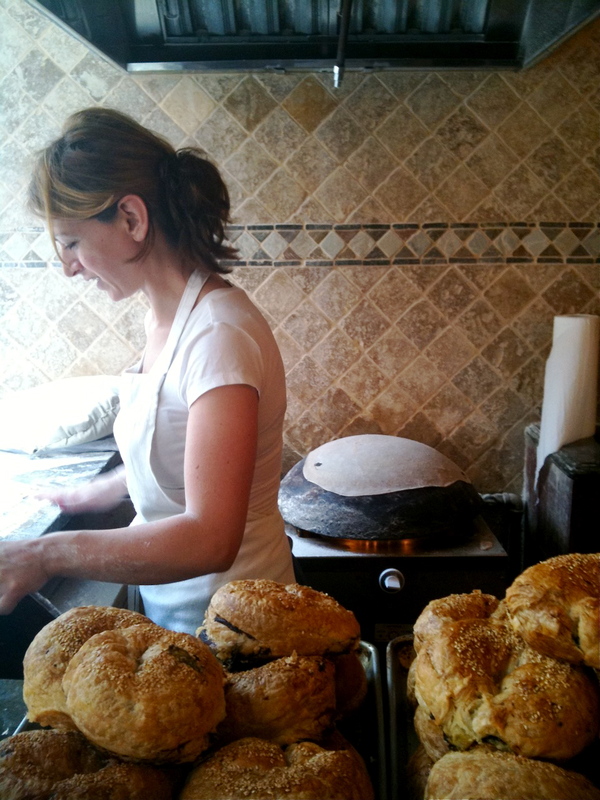 The owner, Gazala Halabi, was placing paper-thin rounds of dough on the taboon, which will later become Druze pitas. We had wonderful bourekas: one filled with sun dry tomatoes and goat cheese, and the other was with spinach and feta cheese. The kids had a Druze pita wrap (“laffa”) with salad and falafel. The plate was wiped clean off the lamb kabab that was there merely 20 minutes before. Staying in the city: restaurants will now need to display the cleanliness rating of their facility according to new letter-grading rules. Now, when deciding upon your next dinner in the City, look on the restaurant’s window. Does it have an “A”, “B” or “C”? Under the new plan, a restaurant receiving an A grade will post it at the end of the inspection. If the grade is lower than an A, the restaurant will not have to post a grade until it has a chance to improve its sanitary conditions. The Health Department will return within a month to conduct a second inspection. The ultimate goal is to improve sanitary conditions and reduce the risk of food-borne illness. Going west: San Francisco is requiring stores to post cellphone radiation levels. Those rates are the levels at which radio frequencies penetrate body tissue. whether or not there is a connection between cellphones (and their radiation) to cancer, it sure brings the question to the table again, to deserve a serious awareness. Lately I have read Robyn O’Brien’s book “The Unhealthy Truth: How Our Food Is Making Us Sick and What We Can Do About It“, who has started AllergyKids.com. According to the book, most of Europe and Great Britain, Australia, Japan, and even Russia demand the clear labeling of food products that contain genetically engineered ingredients. Several African countries even refuse to accept genetically modified (“GM“) grain as food aid. According to Reuters, Egypt just announced that it won’t be importing or exporting any GM foods. Today I have also watched the film “The Future of Food” that has reinforced and better illustrated my gut feeling. I am already waiting to watch the much talked about film “Food, Inc.“. It seems that while the world around us has long begun to understand the meaning of contaminated food and its consequences, here in the US, people are either too sleepy, or ignorant, or affixed and have their mind set, that the FDA or big agri-businesses or the government are taking real good care of the people and the food they are allowing us to eat. That’s right, nobody is forcing us to buy GM food, or do they? When we try to buy any box of any food, and read the list of ingredients, do we know which was GM’d ? Do I know if the corn flour, the soy or any other grain was modified? “Organic Consumers Association and allies sent a letter to Kellogg’s on June 12, requesting that Kellogg’s not use sugar from genetically engineered sugar beets in its products or face a consumer boycott. So do I have any free choice in choosing the unmodified foods? not if I can’t identify them. D’you hear the name Monsanto before? I bet that once you start to read a little more about any of those topics above, “Monsanto” will introduce itself right out of those articles you’ll be reading, because it is one of (if not the largest) multinational agricultural biotechnology corporation that has produced herbicides, genetically engineered seeds, and develops and markets Bovine growth hormones, just to name a few. And guess what? Monsanto is fighting hard and lobbying with all its might (and mighty it is) to keep us consumers in the dark. It is fighting against labeling any of the GM foods as such. The Europeans, concerned about the food they eat, chose mandatory labeling of GM foods and ingredients. Here, Monsanto and big $$$ are still winning, and GM foods aren’t labeled. Read more about GM foods. The more I dived deep into the food industry info, I became aware of the knotted political ties that thrive behind the scene of the food industry, the ones between government, pharma- business and agriculture business. I also became aware of the potential role of the chemical toxins added to the foods in the development of autism, allergies, asthma, and ADHD. What is one to do in the meantime? read, learn, watch the movies, get educated, and pass on the word. try to consume organic food products, or at least the basic ones, such as milk, and eggs. try to purchase locally grown fruits, vegetables, dairy and support your local farmers. It’ll probably be long before the labeling of GM food will become a must, or maybe even banned, it’ll take some time before government will subsidize organic farms. But we shall overcome someday. Do you know those kids that almost always make a face at the food served at home, but once they go to their friend’s house, they come back home with stories about how the food was great and how much they ate there.. ? Well, my daughter is such a kid. So home she came, begging her mom to prepare the delicious baked ziti she has ever tasted at her friend’s house. Luckily for me, her friend’s mom, is my good friend Michal. Michal, bless her soul, came to the rescue and provided the basic recipe for her famous baked ziti. Equipped with the shopping list I visited the local store, bought the ingredients, just to find out at home, that I had to forget 2 main ingredients: ricotta cheese and sour cream. SO I had to make baked ziti from whatever was in the fridge, and guess what, our bundle of joy actually loved it !! Of course I didn’t tell her that I altered the recipe. once ziti has cooled a bit, combine it in a big bowl with 1/3 cup of sour cream (that’s all I had left), 2/3 cup goat-milk yogurt, some chopped kashkaval cheese (which is from sheep’s milk), 3/4 cup organic tomato vodka sauce, 2 organic eggs, salt to taste (though I used 1.5 spoons of nutritional yeast instead), ground pepper, and finally, I couldn’t resist some fresh oregano leaves from my garden; mix together and transfer to a large baking dish. Bake in 350° oven for 30 minutes, add (part-skim) shredded mozzarella cheese on top and bake for 10 more minutes. turn off the oven and let baked ziti stay in there for good 5-7 minutes. More than 30 million American children eat lunch at school every day. Sometime soon, Congress will review the Child Nutrition Act, and will have to decide, among other things, to reauthorize the principle of providing all children in school with healthy food choices. That means low-fat dairy choices, fresh fruits and vegetables, and whole grains, and most important, that schools should become soda and junk-food free ! * we can watch the movie Food, Inc.
* we can start at home. prepare and eat simple, healthy food. have everyone sit together at meal time.